Atlanta Braves second baseman Ozzie Albies got paid Thursday. The 22-year-old agreed to a seven-year, $35 million extension with the club, ensuring he’ll be part of the team’s exciting future. 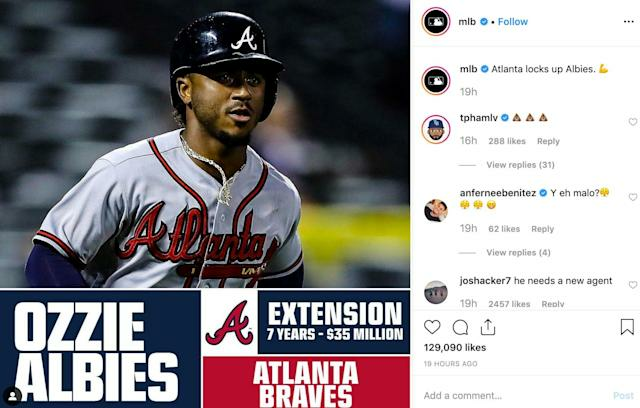 While players getting paid is normally a thing other players want to celebrate, at least one major leaguer wasn’t happy about Albies’ extension. 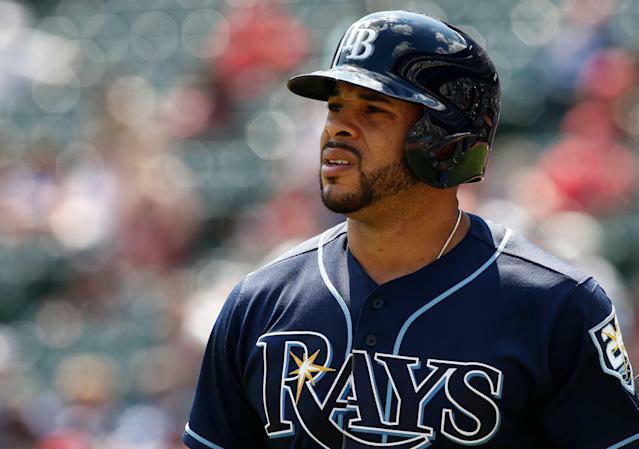 That player would be Tampa Bay Rays outfielder Tommy Pham who used one mean emoji to describe how he felt about the deal. Pham, whose Instagram handle is @tphamlv, sent out three poop emojis in response to MLB’s Instagram account announcing the deal. Why was Pham upset about one of his colleagues getting more money? For the most part, Albies’ deal has been criticized by analysts who believe he sold himself short. Dan Szymborski of FanGraphs used his projection system — ZiPS — to estimate Albies’ performance through 2028. After looking at the numbers, Szymborski concluded Albies may have left $200 million in future earnings on the table. Szymborski’s colleague, Craig Edwards, came to the same conclusion when comparing Albies’ extension to similar deals signed by players with one year of service time. While you can’t blame Albies for taking the money, the extension favors the Braves quite a bit. If Albies is merely a league-average player, they just locked up solid production for potentially nine season — if you include Albies’ option years — at little cost. If Albies is anything more than that, the Braves pulled off a major heist. You might think Pham should mind his own business, but Albies’ deal does have an impact on other players. Every extension handed to one-year players moving forward will use Albies’ deal — which many consider a massive underpay — as a guide. Albies is far from the only young player to sign an extension this season. A number of promising youngsters have inked long-term deals to remain with their clubs, including Alex Bregman, Xander Bogaerts and Ronald Acuña Jr.
Those deals represent a double-edged sword to players. On the one hand, it gives them an opportunity to receive life-changing money. On the other, teams typically offer deals below a player’s market value knowing the player can’t consider offers from other teams. Albies took the security. He likely knew he was leaving money on the table, but found it difficult to pass up $35 million. While he was comfortable with that tradeoff, Albies also impacted those who will come after him with that decision. Pham knows where all of this is leading, which explains why he compared the deal to bodily waste.